Pop star Janet Jackson can afford to dine anywhere she wants. 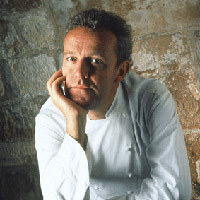 Unless that happens to be Chef Alain Passard's (pictured) l'Arpege in the 7th. No amount of money will get her in. The Irish Times says Jackson's been banned from the resto for not calling to cancel her reservation. Surely, there is a personal assistant or Ritz Concierge who could assume the blame for Janet; it's doubtful she makes her own rezzies. "No-Shows" are, apparently, a "no go" at l'Arpege, and Janet...Miss Jackson...has had the welcome mat pulled from beneath her Manolo Blahniks. This harkens back to the time Oprah Winfrey was left at the stoop of Hermes when she tried to gain entry at closing time. Sometimes Parisian indifference trumps U.S. Star Power, and the result is always salacious gossip. Or is this a simple case of strategy. Do the folks at l'Arpege understand, as we do, that Janet sitting on your curb brings more attention to your establishment than Janet simply unfurling her serviette at a private table inside? L'Arpege doesn't seem like a place that needs any publicity and Janet denies a reservation was ever made. She DESERVES to be banned! What an ego-maniac she is! I’m the Journalist - Is a free website that you can report news. So whatever is happening in your world, city, or neighborhood you can report on it. We are just starting off and hope you will send us your news. May be she deserved getting banned from resto...its not kinda surprised me..